Velovitamine.fr / Who am I ? WHO IS YOUR INSTRUCTOR ? 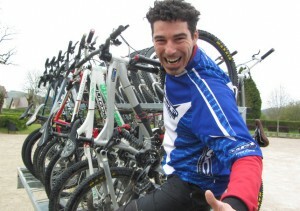 I am a qualified sport instructor, specialized in open air activities and biking activities (including bike fixing). I am also specialized in wine. I love open air sports, cycling, climbing and hiking. I love discovering all the hidden treasures which are provided by nature. I am totally involved in any activity I offer. My aims : share simple and efficient methods with you to help you in our activities and to encourage you to spend your energy and to relax in a friendly atmosphere so that every day is a source of joy and well being!